Welcome back to Satisfaction for Insatiable Readers...the place to FEED YOUR NEED TO READ each and every day of the week. It's October and while we read spooky, creepy fun books throughout the live long year, the Fall season seems to bring them out in droves. Problem? Not in my book….so let’s have a little autumnal fun now, shall we? Today, we have a guest here at the site who is making their way through the blogosphere this month spreading joy and laughter…okay, spreading the joy reading and a few spine chilling bookish thrills…along with a bit of contest fun. Perhaps you’ve heard of him before…but if you haven’t, get ready because I have a sneaking suspicion that you may be adding his most recent release to your “future reads” list. With a guest post to take you back to those gorgeous Fall days of yesteryear (or perhaps the Fall day outside your own window, right now… *jealous*) with just enough “spook” to keep the BOO in the season, may I present….author John Everson! Ouijas and Witches and Weirdness... oh my! When the summer breezes turn cool and blustery, and the trees suddenly change from lush green towers to skeletal figures with leaves withered and browned... it's time for Halloween. If you grew up on the West Coast or deep in the south, you probably can't identify with the Midwesterner's love of autumn. It's a time of gathering darkness. The sky seems ominous; the houses loom angrily against the backdrop of dead leaves. The last remnants of the summer harvest -- dried corn husks and pumpkins -- offer the memories of a rich season gone by. Autumn is the season of dying. It's also the time of Halloween - that holiday that straddles the point of dying (autumn) and death (winter). Halloween is the crossing point. It's no wonder that it grew to become the holiday of ghosts. October is a time of things passing on, the end of the year's harvest. I love autumn. Amid the chilling breezes and piles of broken leaves there also hide the scents of hot cinnamon tea and the smoke of those broken leaves, burning in backyard fire pits. There's something about the grey skies and piles of leaves and general growing darkness that speaks of mysteries; secrets waiting to be found amid the bones of summer. I love to write about this time of year. 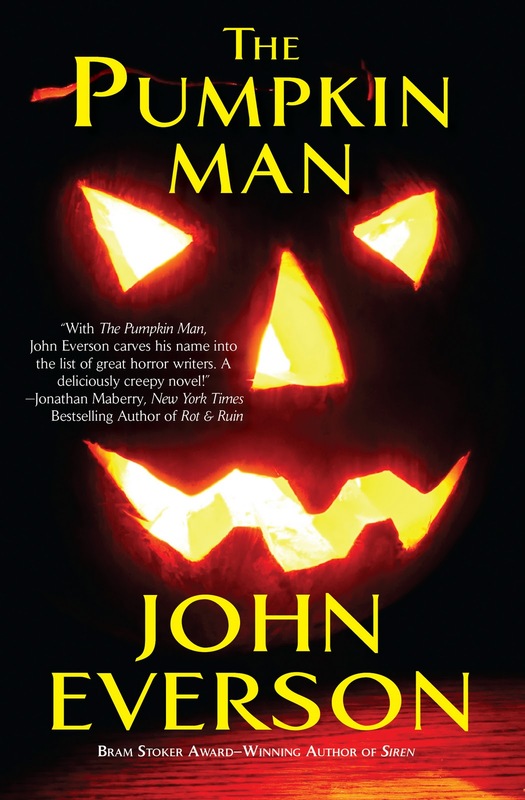 And while it's not actually set in the autumn, my new novel The Pumpkin Man was actually inspired by my short story of the same name that Doorways Magazine published several years ago. That short story did take place at Halloween, when an amazing pumpkin carver is revealed to be doing more than simply carving intricate jack-o-lantern faces. He's stealing the essence of his models to make his lifelike gourds, and the people he sculpts are never seen again. When it came time to think of what I wanted to write for my fifth novel, I remembered this mythology I'd invented in the short story, and thought it made for a good jumping off point for a full book-length story. And so The Pumpkin Man novel was born. Unlike the short story, which follows some kids in their meeting with The Pumpkin Man, the novel is about two Chicago school teachers who lose their jobs and apartment in the same week. The main character, Jennica, has also recently lost her father to a bizarre decapitation murder. Jenn and her roommate decide to go to visit a cottage on the Northern California coast that she's inherited. But one look at the bookcase in that cottage's living room gives them a pretty good clue that Jenn's late aunt was a lot more than just a Flower Child. The Pumpkin Man transplants some of that Midwestern autumnal vibe to a remote Northern California location. And the jack-o-lanterns we love at Halloween are The Pumpkin Man's calling card regardless of season -- he leaves them in place of the victim's heads. The Northern coast of California shares a bleakness and loneliness that reminds me of October. It's a place where hidden secrets may lie undiscovered for a long time, because so few people live there. It's a place where witches may have practiced their craft for generations, unfettered. It's a place where basements could hide crypts and jars of foul things gathered for occult purposes. 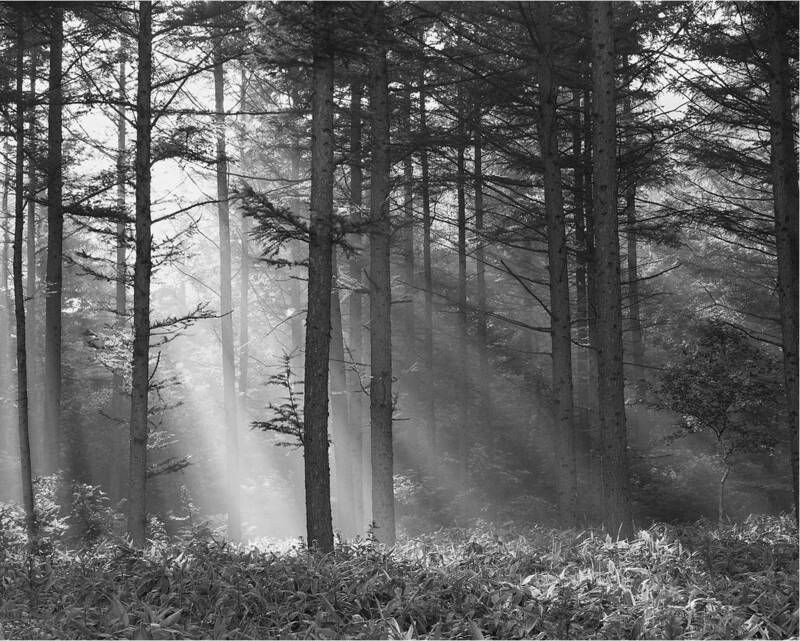 It's a place that could have a connection to a far-flung past world of druids and dark magic. It was the perfect place to set a creepy horror novel with some Halloween-inspired secrets. I hope you'll share some of that vibe with me. Warm up a cup of tea, pull up the afghan, and turn down the lights. Open The Pumpkin Man and slip into the season with me. Go to the new site for The Pumpkin Man: http://www.thepumpkinman-horror.com/ and ask the online Ouija Board your darkest questions! And then enter the Contest to win free autographed John Everson books or e-books, as well as autographed CDs from the band New Years Day. 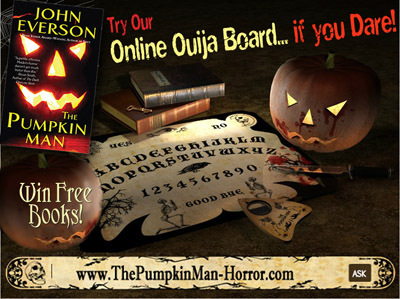 Make sure you note that you are entering the contest from the Satisfaction for Insatiable Readers blog when you enter -- someone from THIS blog will win an e-book edition of The Pumpkin Man, and be added to the Grand Prize contest! 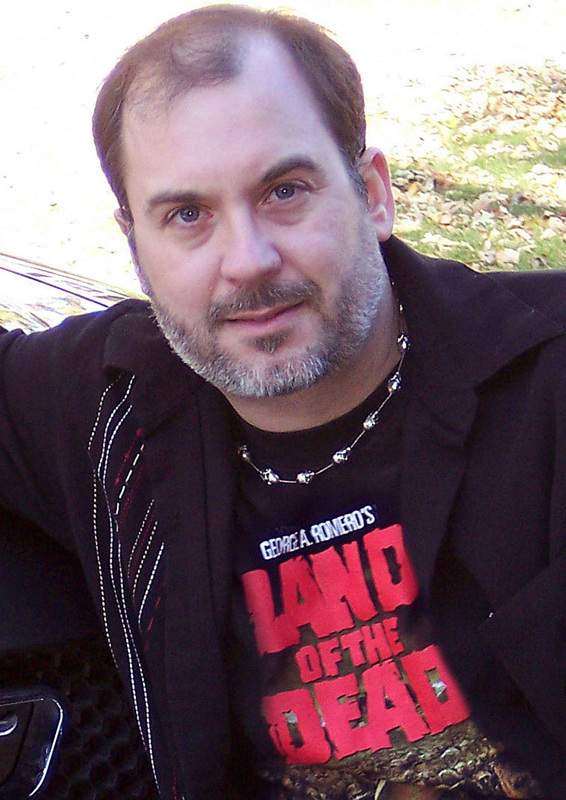 John Everson is the Bram Stoker Award-winning author of the novels Covenant (2004), Sacrifice (2007), The 13th (2009), Siren (2010) and The Pumpkin Man (2011). Over the past 20 years, John's short fiction has appeared in more than 50 magazines...His short stories have also been translated and published in Polish, French and Italian. In 2006, he co-founded Dark Arts Books (http://www.darkartsbooks.com/) to produce trade paperback collections spotlighting the cutting edge work of some of the best authors working in short dark fantasy fiction today (they have since produced four anthologies). John shares a deep purple den in Naperville, Illinois with a cockatoo and cockatiel, a disparate collection of fake skulls, twisted skeletal fairies, Alan Clark illustrations and a large stuffed Eeyore. There's also a mounted Chinese fowling spider named Stoker courtesy of fellow horror author Charlee Jacob, an ever-growing shelf of custom mix CDs and an acoustic guitar that he can't really play but that his son likes to hear him beat on anyway. Sometimes his wife is surprised to find him shuffling through more public areas of the house, but it's usually only to brew another cup of coffee. In order to avoid the onerous task of writing, he records pop-rock songs in a hidden home studio, experiments with the insatiable culinary joys of the jalapeno, designs book covers for a variety of small presses, loses hours in expanding an array of gardens and chases frequent excursions into the bizarre visual headspace of '70s euro-horror DVDs with a shot of Makers Mark and a tall glass of Newcastle. For information on his fiction, art and music, visit his website at John Everson: Dark Arts at http://www.johneverson.com/ or his pages on Facebook (www.facebook.com/johneverson), Twitter (www.twitter.com/johneverson) or MySpace (www.myspace.com/johneverson). 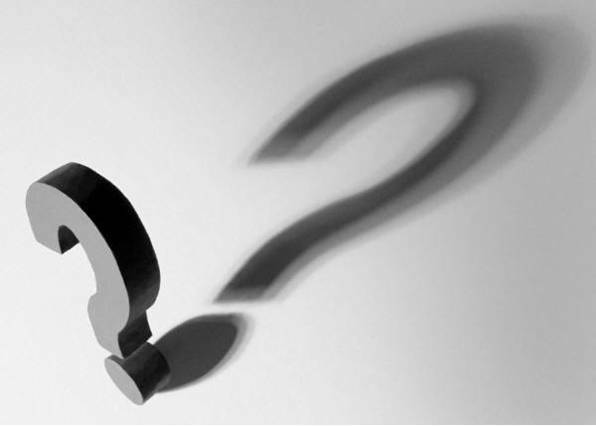 Curious to find out more about this author and his work? Adding one or more titles to your wish list as we speak? I wouldn’t blame you in either case. As you read, there’s a contest going on RIGHT NOW through 6 PM CST on HALLOWEEN NIGHT (10/31/11) so be sure to head over to the site for all the juicy details. Entries as easy peasey and PLEASE be sure to mention SATISFACTION FOR INSATIABLE READERS as the site that referred you when you submit your entry. (Pretty please with black and orange sprinkles on top?) Oh and yes, it IS open to ONE AND ALL (as in INTERNATIONAL)…I asked ^_^ ...so have at it guys! If you simply MUST get your hands on a copy of one of the several books he’s previously penned, just click here to be taken to his site store filled with links to several purchasing options. Be sure to check out the other stops along the tour (the schedule for which can be found on his site)…including tomorrow’s visit to Jenn’s Bookblog. Until next time…good luck…and happy reading! Only too happy to share this vibe with you, only make mine a hot chocolate instead of tea. Oh and could we light some candles?